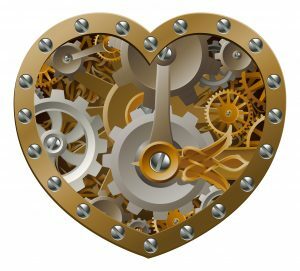 Every month, we ask ourselves, “What is Steampunk?”, and we think about it again. 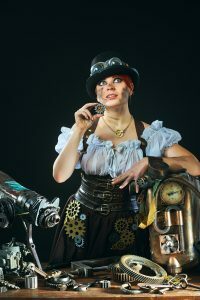 Steampunk is a creative focus, based re-imagining the 19th century, which you can use for any form of inventiveness. It could be music, art, dress, writing, games – and those are just beginning points. Steampunk uses a near past, a past close enough that we can find its clothing in thrift stores, but far enough that it’s clearly a different world. That’s a pretty unique place. Dieselpunk is wonderful, but different; it’s hard for the 1940s not to be overwhelmed by the Third Reach. Come closer in time, and we’re still actually dealing with the hippie movement, with the remnants of the greed and challenges of the Disco Area; and while the 80s were marvelously weird, they’re well within the living memory of hundreds of millions of people. It’s hard to feel like you have free creative reign with a time which is, in a sense, directly visible in our own world. In 1786, J.H. Müller proposed a difference engine, but could not get it funded. Charles Babbage’s Difference Engine was proposed in 1822, and received its first funding in 1823. Maybe that’s it. Maybe that’s the moment Steampunk started – a world which had the concept of modern computers and was ready to make them, but was more than a century away from the electrical knowledge needed to begin the Information Age. You had a world which was beginning to have very deep knowledge, but wherein it was still widely believed to be possible that knowledge was finite, and the world was ultimately something which could be understood. You just had to explore hard enough, search bravely enough, create innovatively enough – and you might figure it out.